I have a lot of great memories as a kid of Earl Weaver, the Orioles and Memorial Stadium back in the late 60's and early 70's. 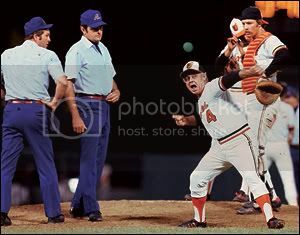 One of the best Orioles managers ever. I loved how passionate he was. RIP Earl. I laughed until I ached over some of his antics with the umpires.. running back into the dugout and running back out with a rule book that he tore up into little pieces and threw it on the ground.. or running out kicking dirt all over home plate.. He was a hoot. Added a lot to the fun of watching the Orioles play. Watched the game and hoped there would be a controversial call so Earl could do his thing..